Image size reduced, original size: 850 x 800. Click here to view the image in its original dimension. Sega announced on their official website a new location test in Japan going from August 4-7. Not much details other than its Initial D Arcade Stage related. We're around the two year mark where a new game is usually announced, so chances are that we will be getting a new Arcade Stage entry of sorts, either a D9 or a D8 Kai most likely. We will know more next week I guess as details emerge from the location of the test and of course the envitable annoucement. Sega announced on their official website a new location test in Japan going from August 4-7. Not much details other than its Initial D Arcade Stage related. We're around the two year mark where a new game is announced so are that we're getting a new Arcade Stage entry of sorts, either a D9 or a D8 Kai most likely. We will know more next week I guess. That logo Arcade Stage Legends www. Possibly new machine/cabinet, awaiting pictures from Japs on twitter on the loc test day. Speaking of which, SHINN was the one who told me the whole thing while translating some of the words so hats to him for the tipoff. We were getting suspicious also the event annoucement was so later than usually this month. So something was off lately....Now it all makes sense, Sega was also probabaly busy planning for the location tests. Personally, I think that ID8's physics was almost perfect. But still lacks of great variety of cars (especially the classic JDMs, as well as non-Evo Mitsu) and courses (remember the missing 246's home course?). 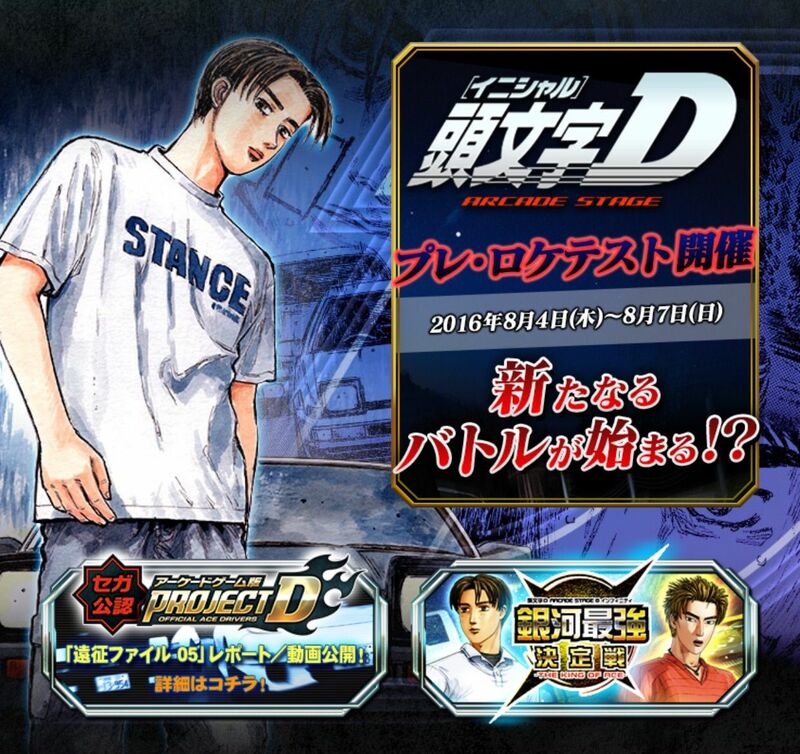 My thought of the new Initial D Arcade Stage could be a reboot or something beyond like going to do the WMMT's way (but too early to predict). As long as Sega willing to keep the ID8 physics, then I'll be much looking forward. It'd be wicked if they switch the game physics to realistic driving, with clutch and MT gearbox. Cornering won't be as fun as its predecessors anymore, though. Did someone say MT gearbox? Your wish has been granted. Disappointed with the two changes personally, I vastly prefer sequential shifters and I don't think I like the Aime card thing as a whole either, even if it does solve the problem of the complex card readers currently in use. Do Aime cards even work offline by the way? Because if it doesn't that means North America might be stuck without the ability to use cards even. Certainly hope it does work offline. I like the idea of the actual manual in the game, but sometimes it can go into the wrong gear accidentally, and also it's tends to break easier (as well as the gear entry is not registered, or back to neutral) compared to the sequential style (the experience from any WMMT players). 1. Probably using back the ID8 physics, but could be even more realistic. 4. Could be something else, any ideas? Disappointed with the two changes personally, I vastly prefer sequential shifters and I don't think I like the Aime card thing as a whole either, even if it does solve the problem of the complex card readers currently in use.offline. I agree about sequential shifting, feel like it's part of what makes IDAS unique. What is it about Aime card that you don't like? I stopped playing arcades for a really long time so I'm out of touch with the technologies. There is a video that shows the gameplay briefly, you might have missed it. The physics looks quite different from D8. Footwork resembles that of D7, but the drift feels more slippery. What is the leveling style of D6 and how does it differ from that of D8? - Actual manual would require a clutch though. This is more closer to it in terms of the shifter style but it's still technically semi-automatic. - Early locations tests are not necessrily indicative of the final physics I recall. For example when they did the D5 location tests, the used D4 physics instead but the final D5 turned out to be be very different. The same goes for the race HUD they recycle some elements from the current game but is completely gone by the final new version. - Leveling systems though, tend to be representative of the final version more often than not. So most like this will stay in the final version. Personally I hope they keep using Eurobeat music genre like the original anime series. I like rock style they use in the movie usually but it's just not Initial D to me. At this point, I'm personally quite worried whether Malaysia will get it or not honestly. The economic environment is pretty tough on arcades right now and IDAS isn't as popular as say Wangan, so a new machine will be quite expensive. Quite likely the two-cabinet norm from pre-D6 will return at a minimum given the costs associated with getting a brand new machines. The price to players will also be quite high I assume. Right now, each IDAS machine has a dedicated mechanically complex card reader. You insert your card at the beginning of the game, when your game is done the machine will save your data into the card before it is ejected and pick it up again. Unless it's a problem with the card reader or things issues version incompatibility your card will more or less work. Sega does store some of your data online like records and progress but the bulk of it is stored offline. If your arcade has online and you subscribe to Sega's D.NET online service, a complete backup of your card and all its info is available at all times, so if you lose your card you can "recover" it by buying a blank card and going through some steps on the online arcade machines. Here, Sega will restore the backup lost card data stored on their server and save it to your new blank card. (I skipped a few steps in the explanation but that's the gist). While the card reader is a pain to deal with sometimes, it is the best of both worlds in my opinion. Sega's Aime card works pretty much like Namco's Banana Pass card, in the sense that it's a fully online system. At the start of your game you "tap" your card at card reader pad, and that's it, you then put it back in your pocket. The game will then collect your data from Sega's cloud servers and when you are done with the game it will save your data back on the server. No progress data is saved on your card AFAIK. The problem as you may have guessed is that you can only use your card when there is an online connection. Unlike the old system, there is no offline data saving here. If you happen to go to your arcade and their connection is out then well, you're pretty much stuck playing with stock cars with no progress savings until they fix that. If your arcade doesn't have the online service for the game at all, you can't use the cards to save your data, period. At full functionality Aime works well I guess, you can just keep your card after your first tap and the card reader is mechanically very simple. So there will not be any problems like the cards getting stuck and such. It is the "requirement of online just to use your card" thing that bugs me. Also it's a general computing philisophy of mine in real life, since I hate not having the option to store and use my save data offline. I do not like fully cloud systems for something that can be reasonably done offline, and simple things like game save data fall under that category. Not that I don't use cloud systems, I do use them and they have their benefits just that I don't like relying solely on them and I dislike systems that stop working when the connection is down. Things like not being able to enter online battles when the connection is down is very reasonable, but things like not being able to access basic progress data is not. Instead of categories like E3, E2, etc they use levels that go from 1 to 99. D4/D5/D7/D8 all use the letter system. Honestly I much prefer the letters though it's not like a deal breaker or anything. At full functionality Aime works well I guess, it's the "requirement of online just to use your card" thing that bugs me. Also it's a general computing philisophy of mine in real life, as I hate not having the option to store and use my data offlin. I do not like fully cloud systems for something that can be reasonably done offline, and things like game save data fall under that category. Makes sense. Personally I'm also not a big fan of systems that require synchronization with the cloud. To have the freedom of playing a game taken away from me just because the machine isn't connected to the internet is a step backwards. The current D8 card system is the best of both worlds - you get cloud synchronization which enables certain features like checking your profile online, and you'll still be able to play the game offline with all your progress. Part of it also because I feel for the North American (and Europe and others without online) userbase of IDAS players. It's one thing to not have online battles, it's another thing completely to not even have cards to play with. Some of us in Asia have had online since 2011 when D6 came out but I still remember the days that we didn't. If it was us and we were hit with the ability to not use cards at all, well I would be really pissed. The only hope for these areas to have to get to play cards if their arcades are willing to agree to the monthly subscription and revenue share contract with Sega - and of course that Sega even offers it some of these locations in the first place. Who knows, like N643 says, maybe just maybe Sega might offer them. Though at the same time I don't blame Sega too much. At the end of the day these problems are relatively minor for Japanese arcades which is their main market. I even guessed it was inevitable since Aime already exists, but to actually see the transition is another thing I guess. Oh well, beats not having D9 at all I guess......or I guess should say D0 now. Looks like this game will be based on the Legends series, judging from the characters styles and team stickers. I just hope that they don't remove Eurobeat, cuz if they do, I'll quit. The "All-new BGM line-up" scares me... are they going to get rid of all eurobeat?